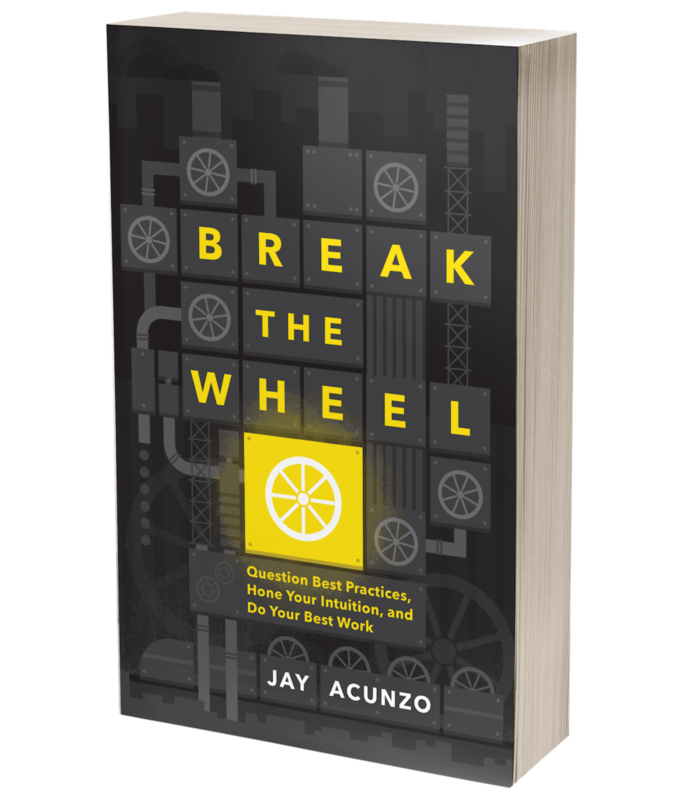 One Simple Story: A 3-Step Framework for Telling More Compelling Stories — Jay Acunzo | Author. Speaker. Maker of Shows About Work. The following was originally shared via my weekly newsletter, Damn the Best Practices. If you like what you read, consider subscribing at the bottom of this article. I’ll send you my all-time most popular pieces right after. Pay attention to these four stories, because, yes, there will be a quiz at the end. Story 1) The itsy-bitsy spider went up the water spout. Out came the sun, and he happily continued his climb. Story 3) Meet Steve Jobs. He’s a wildly creative dude. Together with his cofounder, Steve Wozniak, Jobs built a computer. “Hey, Woz, you deserve most of the credit. Let’s tell the media that,” he said. “Rad,” said Woz. Then Steve turned to Bill. “Hey, Bill? I owe you a ton of inspiration for lots of this stuff, so I'll give you credit for that too." Bill was pumped. “You’re real neat!” he told Steve. Steve’s company thrived, every employee enjoyed working for him thanks to his pleasant management style, and he was always great father and never got sick and still lives in California today. Story 4) Our company is revolutionizing the way businesses grow. By combining best-in-breed technology with exceptional service, we help you realize your dreams. Just ask our customers! (Cut to case study video.) "They revolutionized how our business grows. They combined best-in-breed technology with exceptional service, and they helped me realize my dreams." POP QUIZ! Why do all these stories make me want to press my hand against my cheek and make truly offensive fart noises? And why are they awful? Because they're all missing something. They're missing CONFLICT. In fact, without conflict, I’d argue these stories aren’t really stories at all. They’re just … statements of fact. Conflict, or friction, or uncertainty, or drama, or tension, or something, anything at stake … THAT is the most foundational piece of a story. It's what creates the narrative arc that holds attention, resonates emotionally, and inspires action. Just think about why we call it an "arc" in the first place. Arcs move upward towards a crescendo before sloping back down. What causes that lift? We raise the stakes. Their anticipation grows because they understand that what we're saying truly matters, and they can't wait to hear what happens next. Unfortunately, we often fail to add that piece into our stories at any level: our brand, our team, our careers, our content. When we don’t tell an actual story, what happens to our communication? And when what we say falls flat, they flatline. They feel nothing. They remember nothing. They do nothing. When we fail to tell a story, we become ... nothing. Just a forgettable pitstop in their day, gone once they begin to spend time with something else that truly resonates with them. Snow White and the ... I wanna say four? Four dwarves? They began happily and lived happily ever after. No need to think about them ever after hearing their non-story. Jobs was yet another guy who did well in his career. No lore takes shape. And then, of course, there's our companies and how we usually communicate. We try to win their attention, to earn their trust, and to make them feel, but all we usually do is deliver statements of fact, void of interestingness, because they're void of conflict. "Our company is soOoOo awesome. Have ya heard? Just ask our customers! They adore us, let me tell you what! We'll also tell you why ('cuz of all the awesome), and how (by paying us all the monies), and when (always and forever), and where. (Trusted by over 6.9 million companies, across 1,200 different continents, on 78 different planets.)" We need to get better at telling stories -- genuine, worthy, legitimate stories. Last week, I got a great question from a subscriber named Robert Rouse. He’s building a new product, and as a self-described technical guy, he wondered how he could improve his ability to communicate the power behind what he was building. I’m kidding! I AM KIDDING! But, look, there’s a reason murder mysteries are so popular everywhere from books to TV to movies to news articles. (Experts predict that by the year Whenever Podcasts Became a Thing, every other show will be required to be a murder mystery.) And why? Because if raising the stakes makes for a great story, then few things are higher stakes than putting a life at stake. I call it the One Simple Story. Well, to move from idea to action, we can expand a One Simple Thing into a One Simple Story. Status Quo. This is an agreed-upon belief or state of being. In other words, it's a statement of fact. It is the way it is. This email didn't open with four stories, it opened with four status quos. Conflict. BUT THEN ... something threatens or changes that status quo. (There's a reason every innovation story seems to use the word "disrupt.") Something is at stake, something just got hard, and we face open-ended questions or problems that need solving. Resolution. AND SO ... we reach the conclusion of the story. How is that conflict resolved? What is the answer to our big question, or the payoff to the stakes we've raised. The resolution is the better way of the world or the outcome we all seek on our journey together. Status Quo. Conflict. Resolution. These are the three most basic, most foundational pieces of any story, and way too often, we forget to add the second, and so our audience never journeys with us from the first to the third. Simple? Yes. Transformative? Only if you're communicating with humans. Status Quo: The itsy-bitsy spider climbed up the water spout. Conflict: Down came the rain and washed the spider out. Status Quo: There once was a beautiful princess named Snow White, and like a baker’s dozen of these dwarves. Conflict: Snow White’s mother dies, and her father remarries this horrible woman. Snow's new stepmom keeps asking her magic mirror on the wall, "Who's the fairest of them all?" When the mirror says Snow White, the stepmom tries to have her killed. But the huntsman fails to do so. Then, stepmom disguises herself as an old woman and convinces Snow White to eat a poisoned apple. Resolution: The dwarves help Snow White until the prince ultimately vanquishes the evil stepmom and saves the beautiful Snow, because #truelove and #outdatedgendernorms and all that. Status Quo: There once was a creative guy named Steve Jobs. He wanted to make beautifully designed and simple to use personal computers. Conflict: He received market pushback, fought with his cofounder, and battled the powerful Bill Gates and Microsoft. He was also a terrible father for most of his life, and very sadly, he contracted cancer and died far too young. Resolution: Steve Jobs built the most valuable company in history. He eventually mended his relationship with his daughter, inspired a generation of tech entrepreneurs, and delivered some of the most emotional and uplifting words during a commencement speech shortly before his death. Steve Jobs thus became legend. So what about our story? Whether it's our brand positioning, some website copy, a speech, a case study, or content we publish in any medium, we're faced with endless chances to tell a better story in our work. But each time we fail to add that second piece of the One Simple Story, we get stuck at the first, the Status Quo. We hand out a bunch of statements of fact, and if there's one thing I know you know, it's that facts don't convince anyone of anything. Stories do. Emotions do. What if crafted our One Simple Story? What if we let that inform everything we did? Better yet, what if we created a compelling narrative arc from the perspective of the audience? Our brand might stop looking like a commodity and become the refreshing exception in our niche. Our copy might convert, our speeches might inspire, our case study might actually be worth watching or even sharing (imagine that? ), and our content might earn the time and trust we need to achieve all our goals. Thus, rather than simply claim to be awesome, or best-in-breed, or other abhorrent jargon that prompts my hand and cheek to commence a disturbingly audible dance together, we might instead tell an actual STORY. In the interest of transparency, here's my organization's One Simple Story. For context, Unthinkable Media creates original series with B2B brands. When we tell our One Simple Story, we also set up a kind of filter. Those who agree with or believe in that story are those we should serve. Those who don't see the world that way aren't worth our time. Best of all, once someone passes through that filter -- once they agree that, yes, this is my story, I'm on board, and I'm feeling you -- we reach a sort of "oh by the way" moment. At the end of Unthinkable Media's OSS, there's this implied idea that IF you agree with that resolution, IF you want to hold attention, then, oh by the way, there's a type of content you can create with the one expressed goal of holding attention. It's called a show. That's what we make. We make them solely for growth-stage startups and challenger B2B brands, and we make them refreshingly enjoyable. Why? Because the goal is to hold attention. Stories. They're magic. Glorious friggin' magic. Status Quo. Conflict. Resolution. The most overlooked piece is conflict. We don't need to craft any giant hero's journey, either. That individual you're interviewing for your blog or podcast? She’s struggling with something, whether she's an intern, an author, or an industry veteran. Find it. Explore it. Get her thoughts and more crucially her feelings on the subject. That company you’re building? It exists to solve a problem for the buyer. What is it? Have you described it? Do you own it? Complain about it? Paint a picture of tackling it from the perspective of the customer? That team or entire industry you’re trying to lead? Something's broken and needs to change "out there." Rally others to fix it. Beyond the jungle is a mountain peak. Bring others on that journey. Advocate for that change. Get angry at what's broken, then have the audacity to do something about it. What conflict can you include in your story? We all want to tell a compelling story, no matter what we do or where we work. But too much of what we say falls flat, and as a result, their emotions flatline. We can't continue to keep handing out status quos, pummeling people with statements of fact. The fact is, facts don't change people. Emotions do. So if we can tell a compelling story? My friend, there's nothing we can't achieve. If we only mastered that ability to insert a little conflict, we'd put back the emotion into what we're saying. In doing so, we might finally deliver something worth spending time with, worth sharing, and worth loving. We all want others to care about our work, but ask yourself: Are you actually giving them a reason? Get 1 new story each week about people who do exceptional work. Join “Damn the Best Practices.” No hacks, cheats, or secrets. Only refreshingly different stories and ideas about thinking for yourself when surrounded by conventional thinking. Join thousands of the sexiest, smartest makers and marketers alive. Check email to confirm! I’ll send you something good right after. Posted on November 15, 2018 by Jay Acunzo.